One that will be super soft, and help him to sleep easily. Let’s take a look at the different options you have for purchasing dog blankets. 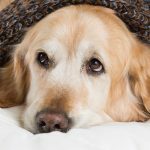 Check out our top recommendations for which dog blankets are best for using at home, in the car and even for dogs with special requirements. Have you ever let your dog loose in the back of your car without a proper blanket? They can slip and slide, scratch the upholstery, and leave behind a furry trail. This is where a dog car blanket can make a positive difference. 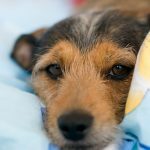 Many of these types of blankets for dogs are fitted to the back of the car seat, making it easy to keep your pet from slipping around and causing general havoc to your vehicle. BarksBar makes a highly rated and popular one that is hammock-style, waterproof, and protects back seats from dirt, fur, and other messes. It is easy to install. All you do is snap the buckle straps around the headrests and tuck in the seat anchors. You can also remove this blanket to machine wash on gentle cycle. AmazonBasics make one that protects the backseat as well and is waterproof. It does a great job of protecting the backseat from scratches, dander, and spills. It is made of 100% polyester and is spot-clean only. If you are looking for one that is quilted, waterproof, machine washable, and has a nonslip backing, then URPOWER Pet Seat Cover is a great option for you. What dog doesn’t like to snuggle up on the couch? Provide extra comfort for your pet while protecting your couch by getting a quality dog blanket for your sofa. Bone Dry is a great choice because it is 100% polyester and machine washable. It’s also lightweight so it’s easy to move when you’re cleaning, and provides protection for your couch. It comes in 10 different colors so you can even color coordinate with your sofa. RZA also makes a lovely pet blanket that is made of ultra soft fleece. It provides comfort and warmth for your dog. The paw print design makes the blanket both fun and attractive. Want an extra cozy blanket for your doggy? KritterWorld makes a Microplush Sherpa Snuggle Blanket that works really well for couches. It is made of an ultra soft material and is reversible for two different textures. It is great at keeping your pet warm. Looking for a dog blanket for the bed? PetFusion makes a premium pet blanket that is comfy for all four seasons. You can place it on your bed to help prevent fur from transferring onto your sheets, or place it on your dog’s bed. Either way, it’ll make it cozy for your dog to lie down in his own blanket. If you are looking for a thick dog blanket that can provide lots of cushion, PetPawJoy makes a dog blanket that does just that. It is incredibly plush thanks to its cotton and fleece design. If you are looking for a great bed blanket throw, then Laura Ashley makes a reversible micro fur pet blanket. This blanket warms up to your dog’s body temperature, keeping him snug all night. Do you want to show off your pup’s cute name with a personalized doggy pet throw blanket? Custom Catch allows you to customize your own cute personalized dog kennel mat. You can choose from six different mat colors and four cute text styles. Looking to provide extra warmth and comfort for your dog? Then a fleece dog blanket may be right for you. 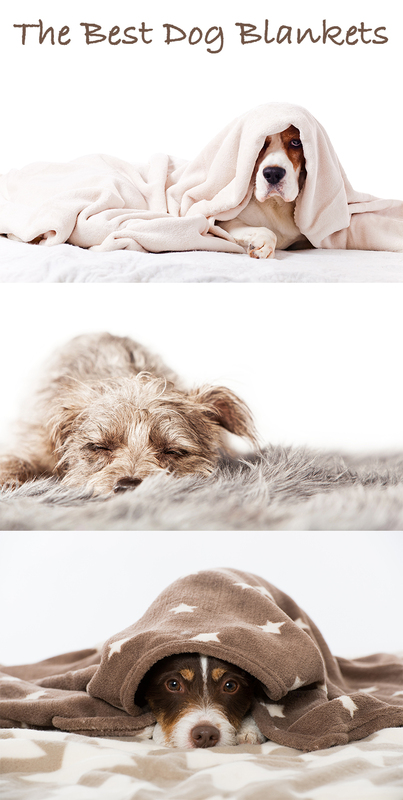 These blankets are so warm and soft, your dog will want to fall asleep in them right away. Pawz Road makes a fleece blanket that comes in three colors and three sizes. It is a well-made blanket that does not easily pill. It is perfect for your couch or inside your car. Another great option is by RZA. They make a very cute fleece blanket that has black paw prints on it. It is comfy and soft, and is 100% machine washable and easy to dry. They also have a satisfaction guarantee, so if you are not satisfied with it for any reason, you can return this item. Another cute one with a bone and paw print design is the Allisandro Warm Fleece Throw blanket. It is a thick coral velvet material and usable year-round. Do you need a blanket to keep your dog cool on hot days? Hugs Pet Products makes a cooling pad that has gel technology. It absorbs body heat and offers cushion for pets with joint pain. This cooling dog blanket is lightweight, portable and resistant to puncturing. It does not require electricity or placement in the freezer. The AKC Pet Cooling Mat is also an excellent choice if you are looking for a water-resistant and dirt repelling blanket. It folds easily and is great for indoor and outdoor use. Arf Pets makes a self- cooling mat pad for kennels, crates, and beds. It provides relief up to three hours, is non-toxic, and wipes clean. Does your dog sleep in a cold room of the house? Or maybe your home is just a tad too cool for your doggy. 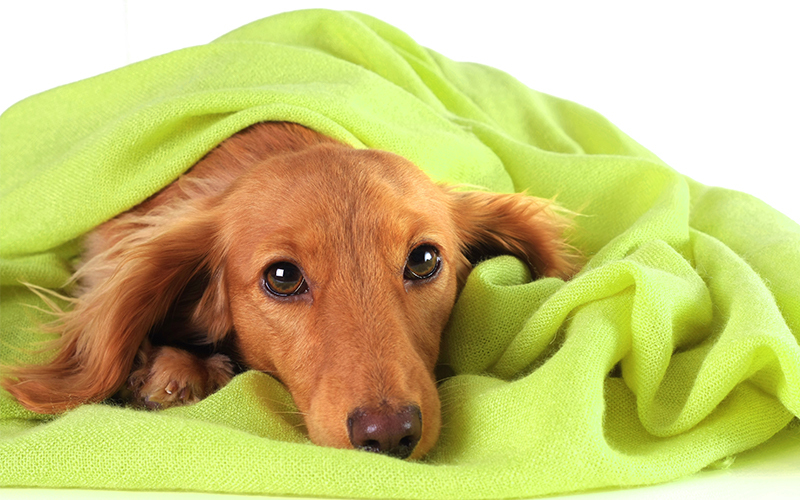 A great option for keeping your dog nice and toasty is getting a dog heating blanket. K&H Pet Products makes a highly rated dog electric blanket. It is the only one of its kind that is made of orthopedic foam. It never exceeds your pet’s body temperature and is comfortable both indoors and outdoors. This one comes with a free fleece cover, too. FLYMEI makes an electric blanket with seven different settings. The internal thermostat automatically regulates the pad’s temperature at an average of 102 degrees F for your dog’s optimal comfort. It is great for older, arthritic, or pets recovering from illness or injury. Help your dog stay comfortable and warm during wintertime. 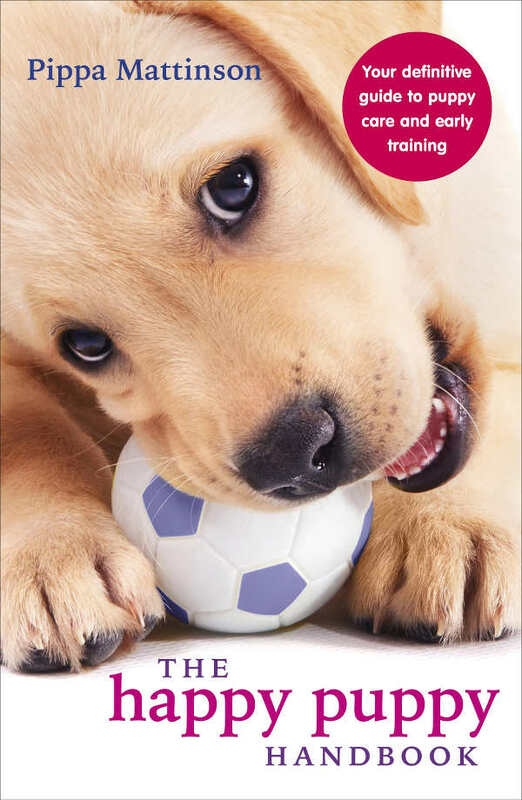 Is your pup going to be a big breed? Maybe you want to get a large dog blanket for your dog. Evelots makes a large fleece blanket that is 60 x 40 inches. It is made from a very soft fleece material for your pet’s total comfort. Want a cutesy large fleece blanket with a paw print pattern? Bogo Brands has one that is both inexpensive and comfy. It is made of ultra soft fleece and makes for ideal bedding. Do you want to dress your dog in a large blanket coat? Do you want a small blanket for your little dog? iNNEXT makes one that is perfect for a puppy or small dog. It is cushioned and has adorable paw prints on it. Color You makes a small blanket for dogs, too. It is made of soft and comfortable polar fleece. This multi-purpose blanket is ideal for pet carriers and beds. Want a horse blanket you can drape over your dog? Fashion Pet makes one that is waterproof and wind resistant. It has good quality fabric, stitching, and hardware. Spot On Dog has a horse blanket that has easy chest and belly velcro closures with soft Sherpa lining and water resistant coating. Does your pup leave a wet mess that you’d rather do without? If so, getting a waterproof blanket for your dog is a good idea. The Mambe Blanket Company makes one that will guard against incontinence, drooling, and licking. It is soft and thick and does a great job at protecting your furniture and bedding. Looking for a 100% waterproof fleece pet throw that is both hypoallergenic and washable? TETON DOG makes a dog blanket that is hand rolled, double stitched edge for a durable look and feel. It is luxurious fleece on one side and soft stain-resistant interlock NanoPore backing fabric on the other side. He&Ha pet makes a waterproof dog blanket that works for both indoor and outdoor use. It is perfect for outdoor activities like picnic, camping, and sandy beaches, as well as indoor use on furniture. It also comes with a built-in storage bag with handle and zipper to store and carry the blanket. Looking for quality dog blankets that don’t cost a pretty penny? Comsmart sells a multi-pack of blankets that come in four, five, or six. And it doesn’t cost very much! These blankets are ideal for pet carriers, beds, sofas, or car seats. Doggy Mink makes a luxurious dog blanket with a silky design, the backside of which is made with a thick Sherpa material. Do you just want a soft fleece blanket to keep fur off your furniture? Pecute makes a great dog blanket that is inexpensive and the perfect size to use on your bed, sofa, or any place you want to keep clean. Do you want to spoil your pooch with a luxurious dog blanket? Pawz Road makes one that is a luxury wrap made of ultra soft double-sided velveteen fabric. It is soft and warm and will keep pet hair off of furniture, beds, and upholstery. BINGPET makes a fleece throw dog blanket that is made of faux suede. It is a perfect throw for any couch, chair, sofa, bed, or carrier. If you love plaid coloring, then Carolina Pet makes a luxurious multi-purpose throw for dogs that is blue and brown plaid. Want a pink dog blanket for your female doggy? Then Bone Dry Microfiber Pet Blanket is a great option for you. It is 100% polyester and is machine washable. It is lightweight and easy to care for. Want a plush pink blanket that is perfect for the couch or inside your car? Then EXPAWLORER is a good choice for you. It is soft and thick and will keep your dog nice and warm. Are you looking for a grey dog blanket? Bogo Brands makes one that is for small dogs. It is made from ultra soft fleece and is ideal for pet carriers, beds, and even floors. The design is a paw print pattern. Smart Pet Love Snuggle Blanket is warm and comfortable for your pet. It’s great to cover your furniture with this blanket. Bone Dry makes a plush pet throw blanket that is great for your couch, car, cage, or kennel. It is made of microfiber material that is much softer than fleece. Your dog will love curling up in this blanket. Another cute dog blanket we recommend has multiple paw print colors on it. It has multiple sizes and colors to choose from. 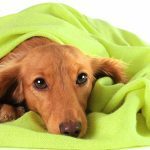 We have taken a look at many different types of dog blankets and seen the benefits of each one. Finding the best dog blanket has to do with what your budget is, the blanket style you are looking for, and finding the one your pup will love snuggling into. 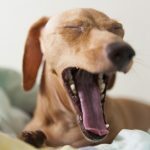 We hope we’ve been helpful in providing the information you need to get the best dog blanket for your furry one.